The new Adidas design - now in their 10th year as kit manufacturers for United - was similar to the previous one, but with some very noticeable changes. Running through the material of the tangerine shirt was a pattern consisting of occasional double diagonal stripes, with three narrow lines running horizontally, and in between were miniature copies of the Adidas three leaf logo. The black collar was now an overlapping V shape, with three thin tangerine stripes as trim. The three stripes on the shoulders now continued down the sleeves, but now the short sleeved version of the top had no cuffs. The black shorts and white socks again remained the same, as they did throughout all of Adidas's time as kit suppliers, with the three stripes on the sides of the shorts and at the turnover of the socks. 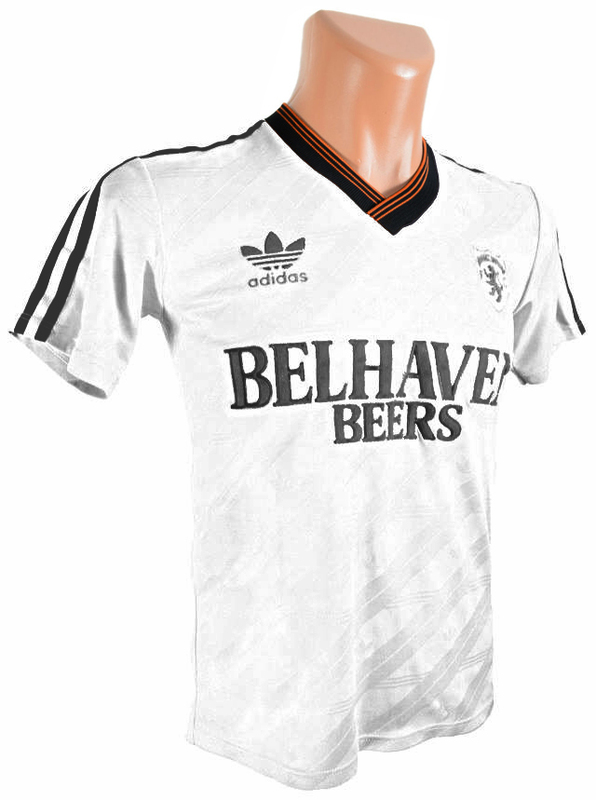 THe White "Belhaven" kit was first seen in a 4-1 defeat at Tynecastle in August, and was last seen in the Scottish Cup semi-final versus Aberdeen at Dens Park in April 1988, where an Iain Ferguson header put United through to their fifth Scottish Cup Final.